Are “out-of-towners” driving New York City’s record homelessness crisis and “flooding” our shelters as the NY Daily News – and now Mayor Bloomberg –suggest? In a word: No. It’s not just tourists and wanna-be starlets flocking to New York these days. The city has also become a popular new travel destination for the homeless — and taxpayers are now paying to send them back where they came from. “People see New York as a land of opportunity, a place that’s welcoming,” said Homeless Services Commissioner Seth Diamond, noting that the city’s unique “right to shelter” law affords housing to everyone. • The article fails to note that City data clearly shows that the vast majority (well over 90 percent) of NYC homeless shelter residents are from right here in NYC – and that their numbers have grown dramatically in recent years, driving the current all-time record homelessness levels. • Also, many of what City officials call “out-of-towners” are actually native New Yorkers who fell on hard times after moving out of the city – and then encountered new housing crises upon their return to their hometown. 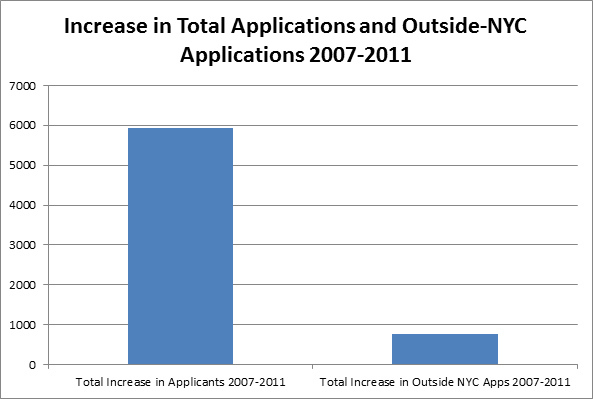 • Finally, the City plays typically fast-and-loose with the data it shared with the Daily News – talking, for instance, about “applicants” instead of families admitted to shelter; failing to provide data for the past year; and ignoring the fact that even the number of so-called “out-of-towner” applicants fell between 2010 and 2011. The bottom line is that the historic rise in NYC homelessness in recent years is due to the widening housing affordability gap facing New Yorkers right at home – and due to the failed policies of Mayor Bloomberg, who has eliminated all permanent housing assistance for homeless kids and families. “And so if you live elseplace in the country, you fly to New York and you go directly from the airport to the shelter system and we have no choice. We have no choice. We must give them shelter. It’s clear that Mayor Bloomberg still doesn’t get it – and he and his officials are still trying to avoid responsibility for the failures of their homeless policies. The number of homeless families sleeping each night in NYC shelters is at all-time record highs and is more than 50 percent higher than when the Mayor took office – and still the Mayor avoids accountability.